I recently discovered a citation (in Breen, 1990) referring to a short article my father wrote for National Fisherman, in 1988, in which he reported on a new kind of lobster trap with a “catch escape panel”, aimed at reducing bycatch. My dad had a steady freelance gig at the time with National Fisherman, and the article was one among several he wrote while researching “ghost traps” – lobster traps, specifically, but really any lost fishing gear (nets, lines) that disappears underwater for reasons random, accidental, or deliberate. A ghost trap (via the Bangor Daily News). With lobster traps, it’s easy to imagine what happens. To retrieve traps and the lobsters in them, a fisher works her way along from floating buoy to buoy (painted in her own distinctive, garish, high-contrast colors for good reason – try tracing a series of such bobbing breadcrumbs in fine let alone foul weather). 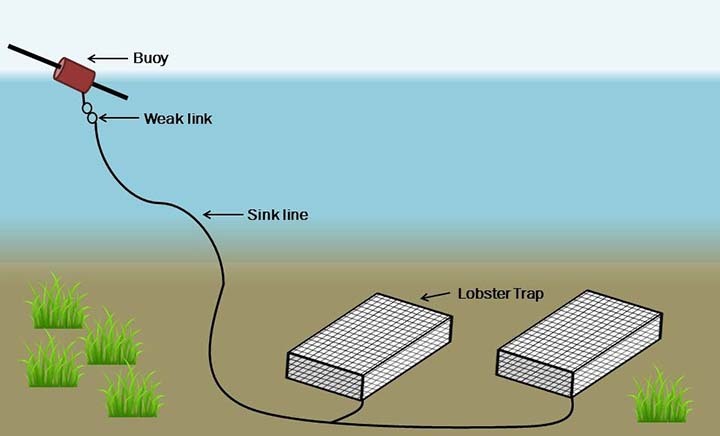 Each buoy is connected to a heavy “sink line” that is in turn fixed to a trap, which sits on the seabed (where the lobsters live). If something – a propeller from a passing boat, for example – parts the sink line, then the buoy drifts off with the current and the trap is lost. And yet the trap keeps fishing. Hence the term “ghost fishing” – which refers to lost gear that continues to catch whatever hapless critters get stuck or entangled (and die) in it. In the 1980s there was a regulatory push in the US to make lobster traps deliberately less effective. Their redesign made it easier for more lobsters to come and go from the trap, and, constructed from coated but degradable wire, the idea was that a lost trap would eventually crumble into a little rusty pile. I went looking for literature on ghost fishing because I had an awkward analogy to satisfy. Over the calendar months of 2015 and 2016 I sank a huge amount of time, effort, and energy into grant proposals. Two (both for large sums of money) I led outright: one was an unusual solo shot, in which I was the only investigator named; the other had a more conventional structure, involving co-investigators from two other institutions, a visiting researcher from a third, and project partners from three non-governmental organizations. Closing the old year and opening the New Year ’tis always a season for reflection. Until last month (which saw the arrival of two publications, here and here, both long in the making), there was little to ink 2016 into my permanent academic record. The past year has been one of transience – not just in leaving one institution to begin at another, but especially in the ephemera of the funding chase. One of my colleagues is adamant about recording that ephemera: he lists all grant proposals, funded and not, in his full CV because each grant represents so much work. He says each one should count for something – at least by being written down somewhere. And that’s “ghost research”: the drafts you write and revise and circulate to collaborators and revise and recirculate; the emails and meetings and Skype chats and phone calls you have with partners and colleagues; the careful bartering you do with impossibly patient finance-office staffers – all that work you invest in proposing a project that will only exist formally if funded. Fishers hate losing gear. Their hearts are in their job (as is true for many of us, who may be so lucky), so a part of themselves always regrets the collateral damage to the animals and environment on which they depend: to not tend one’s traps is to be neglectful, is to abuse that which feeds you. And losing gear is f*£&!^g expensive. A trap lost is a trap that needs replacing – along with its weights and hardware and line and splicing and a buoy and a paint job and the time required to deal with all that. Literally a sunk cost. How far does this analogy go? Maybe it begins to twist. Maybe, unlike a ghost trap, a ghost project that “keeps fishing” is a good thing – maybe it resurfaces some months or years later, all tangled up with other ideas you’ve been thinking about; maybe it gets dragged up from the depths quite by surprise when you meet a new colleague or start working on a proposal that seemed unrelated. It is possible to flip unsuccessful proposals into articles, which I’ve tried (here, for example). Articles form the basis of a researcher’s track record, which in turn constitutes (as an abbreviated CV) the frontispiece of most grant proposals. Haul up an empty trap; re-bait it; set it again. And even funded grants are ephemeral – all traps eventually need replacing. But, undeniably, they do help pay the grant fisher’s costs (which have many forms), and the best bait for funding is evidence of previous funding. So there’s a limit to how much ghost research a person can generate. Balance sheets can’t run in the red indefinitely. Cut&paste mock-up for a diagram that never was. There’s one more turn to make here that may help explain why ghost research can be so frustrating, if you are silly enough to attempt its accounting. (See “emotional investment,” above.) The reason your CV is the only place such a reckoning can exist, should it exist, is that no one else is burning to know about it. Your colleagues, however empathetic they may be, certainly aren’t; those in supervisory roles probably have a sense of your dogged determination, but they’re pondering your funding situation approximately never. They’re busy people. Ghost research is frustrating because to tell everyone what you’re doing, or to list it in an overlong, belated year-end blog post, would be to behave in a particularly annoying way. You know it when you’re on the receiving end. During finals week, for example, it’s the difference between those people studying in the library and those other people who’ve come to the library to complain, at volume, about how much they have to study. In formal terms, it’s the difference between instrumental and expressive behavior. Turns out that no one, not even among your family and dearest friends, really wants to know and understand your laundry list as well as you do, nor do they have the energy to help you process your anxieties about the implications of its myriad items (unless they are paid to do so in a professional capacity, and even then…). And this is especially true when your job, it turns out, involves always maintaining some version of the same impossibly long list – for decades. If it’s not one grant call one year, it’s another grant call the next. Et cetera, ad infinitum, ad absurdum. But maybe in ghost research there’s some functional analogue to a “catch escape panel.” Maybe that’s a space, real or imagined, in which to keep beautiful discards to then find and transform and condense and resubstantiate them. No one else needs to know exactly how much ghost research you have drifting out there – but maybe it’s important that you know where to look if you had to find it. Previous articleBig UpdatesUpped sticks – come find us at University of Southampton (@geogsouthampton)!